Gallipolis Municipal Judge Eric Mulford speaks with River Valley High School students as they take part in a scrimmage before an upcoming mock trial competition. River Valley High School students stand with area criminal justice officials as they prepare for a scrimmage session. Among officials participating in the event include Gallipolis City Solicitor Brynn Noe, Gallia Prosecutor Jason Holdren, Gallia Common Pleas Judge Margaret Evans, Gallia Juvenile and Probate Judge Thomas Moulton and Gallipolis Municipal Judge Eric Mulford. GALLIA COUNTY — While the pursuit of education in law might not traditionally be what one would think of while being part of a high school English class, River Valley High School has turned it into a yearly highlight. According to RVHS English teacher Aaron Walker, 45 students are participating in this year’s competition. 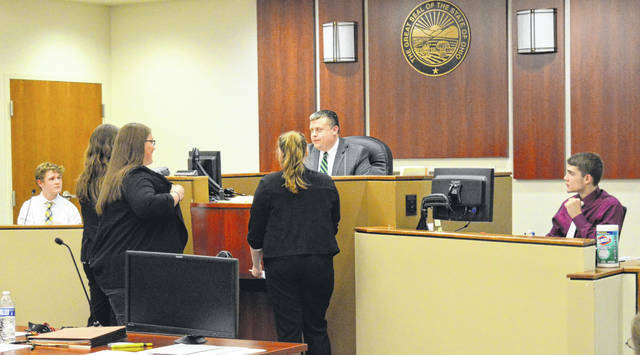 Gallipolis City Solicitor Brynn Noe, Gallia Prosecutor Jason Holdren, Gallia Common Pleas Judge Margaret Evans, Gallia Juvenile and Probate Judge Thomas Moulton and Gallipolis Municipal Judge Eric Mulford took part in assisting with scrimmages, Monday evening, at the Gallia Courthouse and Gallipolis Municipal Court. Noe serves as the chief legal advisor for the students’ preparation to compete in a district competition, Jan. 18. Walker said the competition has a committee of attorneys who put a case together each year and it usually centers around amendment issues. The fictional case RVHS students are arguing this year centers around Fourth Amendment privacy concerns and drone photography. Students pose as either witnesses, attorneys or other court-related persons in a fictional suppression of evidence hearing and make arguments in an attempt to persuade a judge whether video footage shot by a drone was illegally obtained to be utilized as evidence. If obtained illegally, it would not be able to be used in a fictional upcoming trial. Walker said, this year, students had to read seven different US Supreme Court cases to study case precedent. Students typically start preparing for the coming competition in November. Mock Trial is part of RVHS’ advanced placement courses in English. Juniors take AP Literature and seniors take AP Language and Composition. Kaleigh Cox also leads students in Mock Trial preparations along with Walker. “We’re being used as a model curriculum by the Ohio Center for Law-Related Education because we are embedding this as part of our curriculum and it teaches a bevy of standards,” said Walker. After school practices are also held as part of Mock Trial. “I have better public speaking skills which I can use in life and college,” said Mock Trial participant Chloe Gee. “I’ve learned more about the law aspect of life and it’s opened up my viewpoint on court proceedings and how it affects our daily lives,” said participant Jerilyn Darst. “I like how Mock Trial allows me to use my acting skills as well as teaches argumentation, synthesis and logic,” said student Julia Nutter. “I like the competition and the opportunity to learn in a different way,” said student Jacob McGhee.